A press proof is a single copy of your menu, professionally printed by MustHaveMenus and delivered to your door. This allows for reviewing print, and/or lamination quality before purchasing a full order. To order a press proof from My Menus, click order prints below your menu to start the checkout process. From the quantity drop-down, select 1 (if ordering a takeout menu, a press proof order includes 10 copies). Get a print estimate for a press proof here by selecting the menu type and choosing "press proof" from the quantity drop-down. Download a PDF to print a copy in-house. From My Menus, click the down arrow below the menu you wish to download, then pdf. 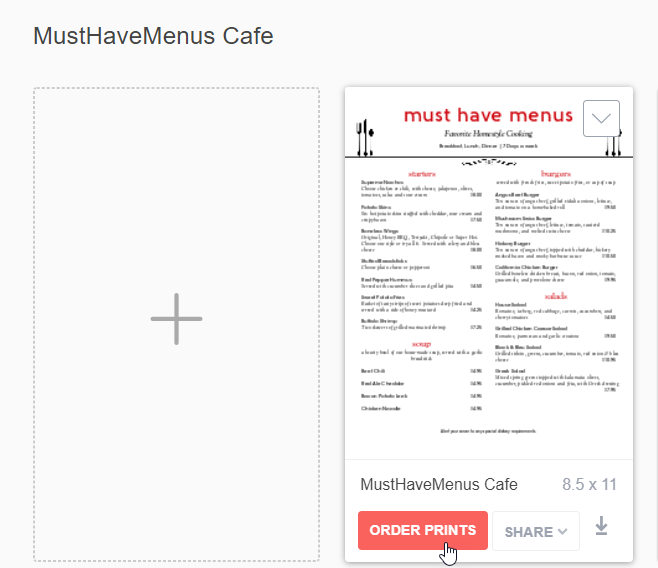 Without a download plan, the PDF will contain a MustHaveMenus watermark, which is perfect for proofing your menu. The watermark is automatically removed upon registration for a monthly or annual plan or when ordering the menu prints from MustHaveMenus.